Update (2): run time clarification – this workshop runs from 10am to 6pm (or really, until the machines are complete). These are complex machines – expect for this to take a while. Update: just to be completely clear: this event is open to anyone who signs up via Eventbrite. PS:One membership is not required. We’ve got a fever, and 3D printing is the cure! 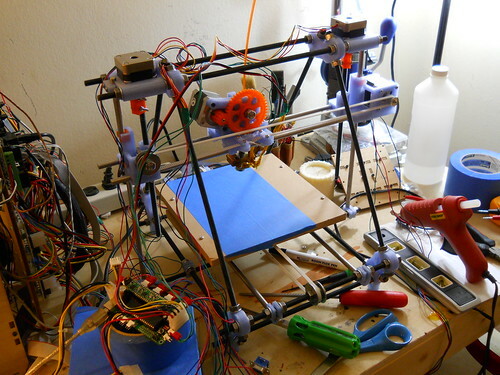 On June 18, PS:One member Chris Jansen will be holding a build-your-own RepRap Mendel Prusa 3D printer workshop. Workshop cost will be $100 (for materials). If you don’t know what it is, a RepRap is a 3D printer that can print many of it’s own parts. A REPlicating RApid Prototyper. If you have one RepRap, you can make more RepRaps, and even give them to your friends! At the workshop, we will receive the parts and support to build the X-Y-Z gantry for a RepRap Prusa – all the plastics, mechanicals, belts, pulleys, MDF build platform, etc. At the end of the day you will have a fully-built XYZ body and build platform that just needs electronics installed and programmed to get up and running. PLEASE NOTE: To complete the build, you’ll need to purchase another $200-$300 worth of electronics and stepper motors and hot ends (price varies depending on the bells and whistles you choose). Please see the wiki page for a listing of electronics not included in this workshop. If you bring your own electronics along with you, assistance may be available to get your electronics installed (no promises). How much: $100 per person (Limit 20). Happy Birthday! I can think of no better present to yourself than a reprap (coincidentally, mine’s the day before the build day). So does this mean that all printed parts and metal hardware is included? That would be really awesome if you guys could do the wade extruder as well, just the printed parts that is. I’ve wanted to build a reprap for so LONG now and I will gladly make the trip from South Bend, IN to do it. Yes, all the metal hardware and printed (well, cast) parts are included. I think the cold end of the Wades extruder is included – here are complete details on the parts being cast). This event is open to anyone who signs up via the eventbrite button. You don’t need to be a member. My partner and I will be sharing this thing. Can we both come and build one together on a single ticket, or is the event limited to 1 person per ticket? Hey Sean, each ticket is for a set of parts (we have 20 sets), so two people working on one machine is totally fine (and will probably be really helpful!). Oh man, sold out already. Any chance of posting videos, or selling the kits online? For right now this is an experimental class – if it works out well (and it seems to be), perhaps Chris will run it again? Yes – I can safely say if it goes well (or possibly even if it doesn’t!) it will happen again. Also, I’d hope that I can get Dan or someone to clone the molds to the space will have a set. I can tell you for certain though – the next class will be a little more expensive. Folks who got in on this first class are getting a /real/ bargain. I would definitely sign up for a future class if it is offered! How did this go? Did anyone bring the cheap steppers from Ebay? What’s the holding torque on those? Do they work well? Several people purchased the eBay steppers – they seem to work pretty well. The event went as well as can be expected for the first run of a very difficult workshop – fun was had, and parts were assembled. Everyone learned a lot, and we’re working out the logistics of a second run of the class. I’ll try to have a followup post in a few days. Just a couple quick comments! 2) We /will/ be doing another class, but start saving your pennies now, ’cause it’s going to come in considerably more expensive. This first class was done at a price point that was /below/ actual cost by a fair margin. In addition to that, the next class will be using printed components instead of cast, and will likely follow the model being used in the RRWT; a two to three day long COMPLETE BUILD including everything needed to print. We’ll probably also copy their pricing model, I think they are charging roughly $1200/classkit. I’m personally of the opinion that something like $1000 is a great deal considering complete kits online are upwards of $800, $1200 is a good deal if we can make the classkits /really nice/ (you know, include some starting upgrades like linear bearings, heated PCB, etc). We’ll probably also keep the class size down to 5-10 in a go.